Ghasabian Dezfooli, M., Hamid, M., Nowruzi*, B. (2017). Evaluation of antioxidant activity of natural product compounds from Platycladus orientalis leaves. Research Journal of Pharmacognosy, 4(Supplement), 87-87. M. Ghasabian Dezfooli; M. Hamid; B. Nowruzi*. "Evaluation of antioxidant activity of natural product compounds from Platycladus orientalis leaves". 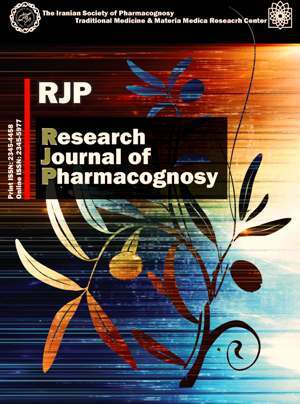 Research Journal of Pharmacognosy, 4, Supplement, 2017, 87-87. Ghasabian Dezfooli, M., Hamid, M., Nowruzi*, B. (2017). 'Evaluation of antioxidant activity of natural product compounds from Platycladus orientalis leaves', Research Journal of Pharmacognosy, 4(Supplement), pp. 87-87. Ghasabian Dezfooli, M., Hamid, M., Nowruzi*, B. Evaluation of antioxidant activity of natural product compounds from Platycladus orientalis leaves. Research Journal of Pharmacognosy, 2017; 4(Supplement): 87-87. 1Department of Biology, Central Tehran Branch, Islamic Azad University, Tehran, Iran. 2Department of Biology, Science and Research Branch, Islamic Azad University, Tehran, Iran. Background and objectives: Natural product compounds of plants have been used since ancient times and in folklore medicine for the treatment of many diseases and illnesses. Oxygen-centered free radicals and other reactive oxygen species, which are continuously, produced in vivo, result in cell death and tissue damage. Oxidative damage caused by free radicals may be related to aging and diseases, such as arteriosclerosis, diabetes, cancer, and cirrhosis. Although almost all organisms possess antioxidant defense and repair systems that have evolved to protect them against oxidative damage, these systems are insufficient to prevent the damage entirely. However, antioxidant supplements from plants may be used to help the human body reduce oxidative damage. Platycladus orientalisis an ornamental conifer of the cypress family. The leaves of Platycladus orientalis have been used in medicine for treatment of gout, rheumatism, diarrhea and chronic tracheitis. This study has aimed at evaluating the in vitro antioxidant activity of extracts of Platycladus orientalisleaves, in comparison with commercially available antioxidants. Methods:The antioxidant activity was assessed by reducing power, total phenolics content, DPPH radical scavenging activity and RBC hemolysis. Results: The results showed that both the water and the ethanol extracts exhibited strong total antioxidant activity. More statistical data analysis is in process. Conclusion: This result may be a major reason for introducing Platycladus orientalisas a good scavenger of hydrogen peroxide, superoxide, and free radicals. However, the components responsible for the antioxidative activity of Platycladus orientalisleaves are currently unclear. Therefore, it is suggested that further work could be performed on the isolation and structural identiﬁcation of the antioxidant compounds from Platycladus orientalisleaves and to evaluate its in vivo effects.